Brush Research is proud to offer the leading choice for in-line machine deburring, edge radiusing and surface finishing applications. The Nampower line is a complete solution collection of BRM's high performance abrasive brush products. These reliable tools will produce consistent quality and cost effective results. The accessories below will assist in creating the optimal results for your application. Our new patent pending lightweight tool holders are designed to be used with all sizes of our NAMPOWER combination filament disc brushing tools. 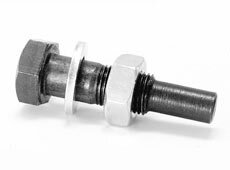 Designed to be used with flow through coolant systems, holders have a standard 25mm shank. 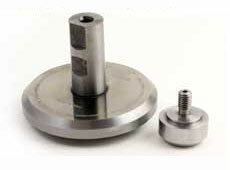 Reducing tool holder weight produces less stress on machine spindle bearings and improves brush performance. The carbon fiber material is highly damping and significantly reduces vibration producing more consistent brushing action and longer brush life. Fits 100mm, 125mm and 150mm brushes. Designed for both Dot and Turbine style disc brushes. This unique reusable holder allows coolant to flow through from the brush center resulting in better lubricant dispersion. 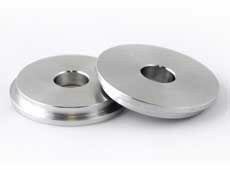 Holders are heat treated and precision ground and have a PVD coating for improved corrosion resistance. 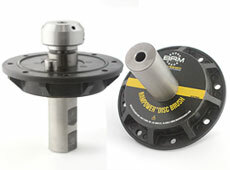 Available with a 1/4" or 3/8" diameter shaft for chucking directly into a drill motor. 1/4" shaft is recommend for brush diameters up to 4" and the 3/8" shaft is recommended for brushes up to 5" diameter maximum.